Lets talk about sports today, ..err ….or lets talk about my relationship with sports. Since childhood, I have never participated in any kinds of sports, yes I spilled it out; I’m not very proud of it :(. The only sports I remember playing is badminton with my “tole ko saathi haru”(friends from my colony) during winter vacation. Other than that until 10th grade, I do not remember participating in any other sports, the only physical activity that I did in school was participate in dance classes, those too were only twice a week for about 2 hours. Besides this, I remember participating in basketball tournament in grade 11 but ended up never playing the match. Its not that sports does not interest me. I have watched football since my teenage days, cheering the teams my brother and Bua cheered for. I have always supported Argentina, while I have always been against Brazil. I remember shouting out for France during 1998 FIFA world cup finals. My interest in football starts and ends at world cup matches and few of the EPL matches. On the other hand, A is very much into sports. He has always played one or other form of sport since his childhood. He tells me stories of how his uncle used to entice him with sweet candies to go swimming when he was little. He tells me stories of playing inter tole cricket tournaments, playing football and cricket at University, playing basketball and badminton. So even here in B city, once or twice a day in a week, he indulges in his sporty pleasures like Badminton or Tennis or Basketball. He is known as a sporty cool guy here (Yo!! ), he kinda has a reputation (I know this is going to make him proud or his nak thulo- literally translates to big nose in Nepali). So, this means either I have to do something else on his sports evening or I have to go with him and play. Its not that I don’t like to play. I always tell A, “If I could, I would”(I’m a big Jack Johnson fan :P), but I guess this is just an excuse to save myself from public display of my abilities (or rather inabilities) at sports in front of his friends. The first month I arrived here, we went to play basketball. I thought I played pretty well for a beginner(well, thats what I thought :P). But guess what, for the next game I was not even invited!!!!! They said they really want to practice the game, so Pro’s only :(. After this I didn’t even bother to ask when the basketball evening was. Then, my next attempt was “Tennis”. Well, my maternal uncles play tennis very well, they’ve even competed in national levels, but until that day I hadn’t even held a tennis bat in my hand. So, I told A in advance, I will take a book with me… just in case. That day, I hit a few balls, A briefed me basic rules, and I played for some time. It was fun. But I knew I slowed down the game, so I volunteered to sit on the bench and read a book (which I have to admit, I enjoyed more!!). After this, A would occasionally ask me to join him while he played tennis and I could read a book on the bench. But I’d rather read a book at the comfort of my room with plenty of lights and I wouldn’t be bothered by mosquitoes as well!! The next attempt was “Badminton”. Now, I did play badminton as a kid, but I know nothing about professional badminton. 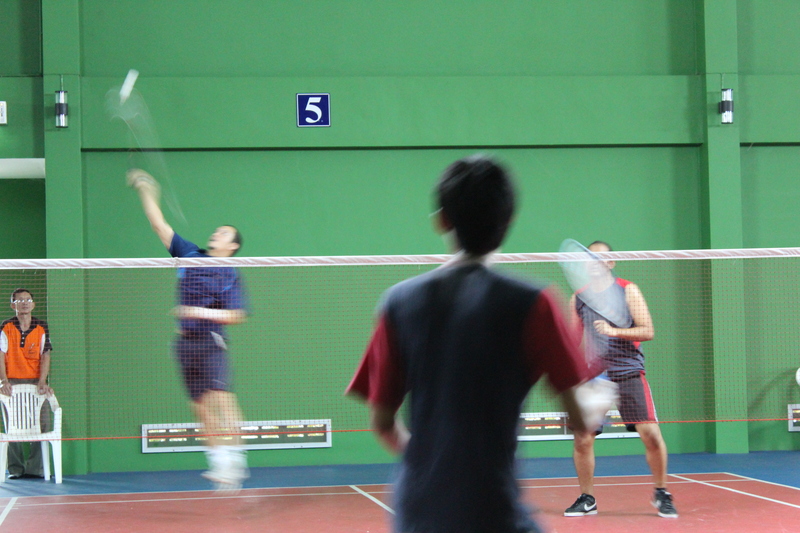 A and his friends were practicing for a friendly Badminton match organized by the PR team. They went to practice quite often but I didn’t join them as I would be slowing them down with my less than amateurish attempts. I went on the day of the match. Thai people are very very good at badminton. They were like WOW, I had never seen the game being played so fiercely…. courtesy of me not watching sports channel that often. A’s team won one match and lost one match. They played ok ok. So when we were ready to go back, I just grabbed the racket and played for sometime. It was so much fun, I liked it a lot. Obviously I didn’t even know the basics but I was finally pleased to find a sport that I can enjoy and I can join A to play :). Early this week, A, me and his friends to play Badminton. We played for two hours, I didn’t play continuously but I did play for quite sometime :).